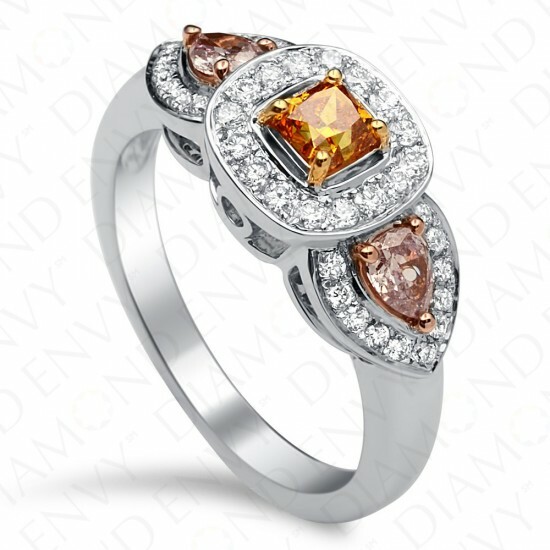 This trendsetting 18K white gold ring features three fiery prong-set fancy colored diamonds – a 0.45 carat SI1 cushion cut Fancy Deep Orangy Yellow diamond flanked by two I1 pear shape Fancy Pinkish Purple diamonds, 0.44 ct. tw. They are framed by elegant halos of 42 pave-set white diamonds, 0.30 ct. tw. Gold weight: 6.10 grams. House-graded.